Welcome to the March edition of TrinityP3’s e-news for 2014. 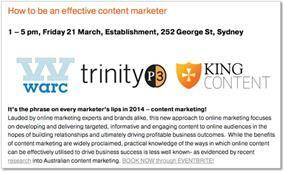 TrinityP3, in conjunction with Warc and King Content ran a half day seminar on “How to be an effective content marketer”. It was a thought-provoking afternoon attended by over 230 marketers. All proceeds were donated to the Charlie Teo* Brain Cancer Research Trust. 90% of Australian marketers claim that they are using content marketing, yet most don’t have a formal content strategy. This was reinforced by only a handful of attendees raising their hands to show that they had a content strategy for their business! I remember very well October 2008 and the six months following. The global financial crisis had bitten deep and marketing budgets had been slashed. There was not a day went by where the conversation with a marketer was about how to best cut the budget while still maintaining their marketing program. We offered advice on eliminating waste, reducing duplication and the like. 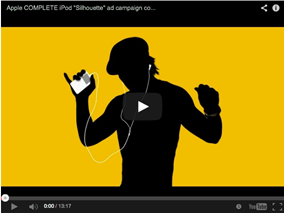 But marketers discovered a much easier approach with their agencies and that was simply to have the agency do the same work for 20%, 30% or even up to 40% less than previously. Afterall, the agency was desperate to hold on to the client and to hold on to as much of the revenue from that client as possible. 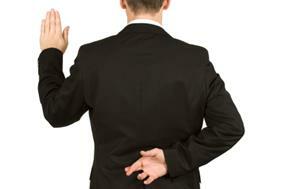 Even if this meant that the staff would have to make up the shortfall in unpaid overtime. This post is by Stephen Wright, Business Director at TrinityP3. You have run the media tender and managed to secure a new agency who has promised amazing savings not only on your agency fees, but also buying your media at 20% or 30% better than your incumbent could ever deliver. What’s more they’ve guaranteed it. In bold type with 100% of their profit at risk if they fail to deliver. Is it too good to be true? It probably is, so prepare yourself for the excuses that will inevitably come should you bother to check if these promises are delivered. I say this because many advertisers are unaware how to determine the delivery of discounts and will often defer to the agency to measure and assess the discount level. In fact I had a procurement professional from a client once ask me if it was usual for the media agency to earn 100% of their performance bonus every year that was the same amount as their $1 million plus base fee? I asked what the bonus was paid on? Strategic Marketing Management and Marketing Procurement continues to grow in prominence as the challenges of measuring return on marketing investment and desire to improve marketing efficiency grows across every category and market. The TrinityP3 blog is evidence of this with consistent growth of readers by more than 300% per year each year since 2011. 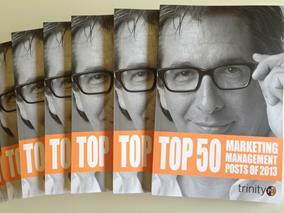 The ‘Top 50 Marketing Management Posts of 2013‘ is 200 pages covering the most popular topics in the category.